Irritable bowel syndrome (IBS) is a condition which is characterized by recurrent abdominal pain, diarrhea or constipation, gas, bloating, abdominal distention and fullness, loss of appetite and nausea and vomiting. While there are conventional medications available that treat the symptoms of IBS, there is no cure. There are many medicinal herbs that can be used as herbal remedies for chronic conditions like IBS and they have been gaining popularity in recent years because they tend to be milder than conventional medications and with a fewer side effect. They can be easily customized for specific needs. But like with any pharmaceutical medication they can work wonders for some people and not work at all for others. Slippery elm is frequently used for indigestion and stomach ailments. It works well for some people as a natural treatment for IBS. However, slippery elm can have laxative effects, so it might not be a good option for those who suffer from IBS with frequent painful diarrhea. On the other hand, the laxative effect of slippery elm might be of benefit for irritable bowel syndrome that is not accompanied by diarrhea. Aloe vera is known for its effects in wound healing and treatment of burns, can also be taken internally. It has anti-inflammatory properties and concentrates of it have been shown to soothe the symptoms in many digestive conditions. It, therefore, might bring relief in IBS. Similar to slippery elm, aloe extract can have a laxative effect, so caution is necessary when applying it to the treatment of IBS with diarrhea. Peppermint oil is antispasmodic (relieves cramps), carminative (relieves gas), antibacterial, and increases bile secretion. All four of these effects can be useful in the relief of the symptoms of IBS. Peppermint can also have relaxing effects on the intestinal smooth muscles. Enteric coated peppermint oil capsules have been used for the natural relief of IBS symptom at a dose of 180-200 mg three times per day. Since peppermint oil can be irritating in the upper parts of the gastrointestinal tract, enteric coated products are the best option as a natural remedy for IBS. Lemon balm is another member of the mint family that could be beneficial to the digestive system. It relaxes the intestinal smooth muscles and also is thought to have stress-relieving abilities. Since IBS symptoms can flare up in times of emotional stress, this herb can bring soothing to both body and mind. Wild yam could be helpful as a remedy for irritable bowel syndrome as it is often used as a treatment for painful intestinal spasm. The tea from the dried chopped root has a very displeasing taste, but it can be combined with other herbs (e.g. fresh ginger root to make it more pleasant). Ginger has a long history of use as an herbal remedy for digestive complaints; it soothes intestinal spasms, improves the tone of intestinal muscles, and reduces nausea. Licorice can also be of benefit for IBS, as it is anti-inflammatory and coats and soothes irritated intestinal mucous membranes. Licorice increases the secretion of the protective mucous coating of the digestive system and increases the circulation within the gastrointestinal tract. This improves the overall health of the tract; one study in Ireland showed a licorice extract to be more effective in providing relief for ulcers than a commonly used prescription drug. But it can increase the blood pressure, so people with high blood pressure need to be careful with this. According to traditional Ayurveda medicine, cardamom soothes the stomach and intestinal cramps and aids digestion. It relieves spasm, which explains it uses as a natural treatment for colitis, indigestion, and cramps, as well as irritable bowel syndrome. Cardamom also contains detoxifying properties, having a cleansing effect on the body. Chamomile has been used traditionally to treat some of the recurring symptoms of IBS as it is thought to reduce inflammation and quiet intestinal spasms. Some herbalists consider chamomile also to be very helpful in relaxing the nervous system. Fennel is a traditional herbal remedy for gas and bloating, and relaxes intestinal spasms. Other natural herbs that have been used for treatment of IBS. Any use of herbal supplements and remedies meant to relieve the symptoms of irritable bowel syndrome should be discussed with a professional healthcare provider to develop a treatment plan specific to the individual need and to make sure they will not negatively affect other medicines. Botanicals and herbal remedies for IBS or irritable bowel syndrome with diarrhea may or may not be the same as botanicals and herbs for irritable bowel syndrome with constipation. 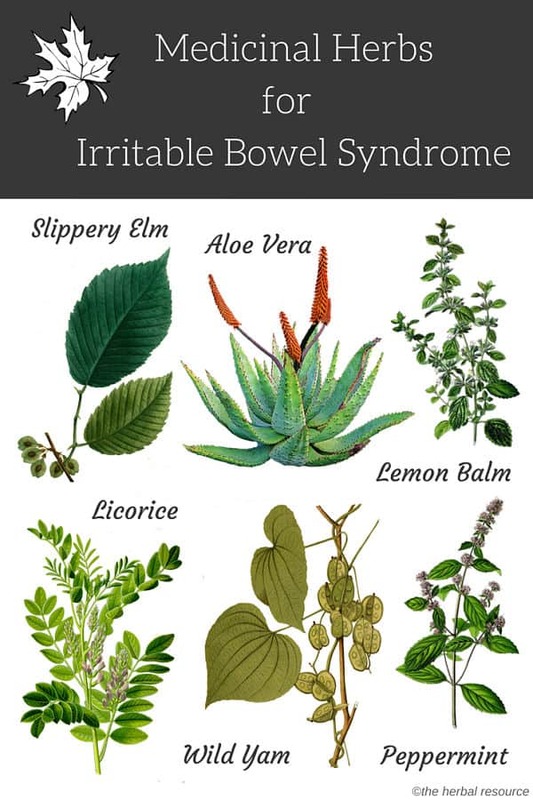 Using natural herbal remedies to treat irritable bowel syndrome is an option that is worth considering and most herbs are safe but it should be kept in mind that they can have side effects just like prescription drugs. Certain herbs, those that contain substances called anthraquinones, are used as stimulant laxatives. Examples of these herbs include senna, cascara, rhubarb and frangia. It is not recommended to use these herbs on a regular basis, and for those whose IBS symptoms including diarrhea, a knowledgeable health provider can recommend different medicinal herbs.